Count on our expert advice and large inventory to find the perfect vinyl flooring to meet your needs. When you visit us in the store, online, or set up a home meeting with our professionals, you get access to beautiful, affordable flooring solutions that match your needs and your personal style. We take the time to get to know our customers’ requirements and expectations, and make suggestions as to what type of floors will best work for them. Our vinyl sheet flooring, as well as our vinyl tile and vinyl plank flooring, are made with high-quality, durable materials, ensuring the beauty of your new floors lasts for years to come. 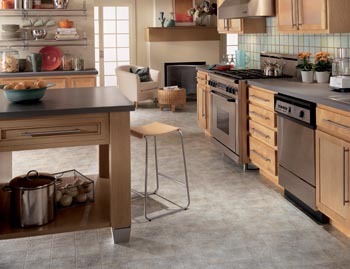 Get the stylish floors you want at a price suited for your budget. Many customers love vinyl because it is an affordable option that comes in a variety of colors and styles. Our vinyl tile flooring, for example, can resemble any number of stone tiles at a fraction of the cost. You can also get the look of hardwood with vinyl plank flooring, which has grains and knots, just as you would find in real hardwood floors. Explore our inventory online or in our expansive showroom. We offer many different colors, sizes, and textures of vinyl options, and we can even emboss the surface of any vinyl sheet flooring to make it look and feel more like stone, ceramic, or wood. If you don’t know where to begin, consult with one of our vinyl flooring installation professionals. We take the time to gather information about your specific needs and narrow down the selections to help you find the right choice for your home. Install luxury vinyl flooring in any area of your home. Vinyl is completely waterproof, making it the perfect option for moisture-prone areas such as the kitchen, bathroom, or basement. Because of its moisture-resistant surface, water and other liquids don’t sink in, making it easy to keep clean with simple methods like mopping and sweeping. In addition to providing easy maintenance, our vinyl flooring installation services give you a comfortable, durable surface. Vinyl is constructed in layers and can have up to three wear layers on top which help provide a barrier between everyday wear and tear and the vinyl itself. In addition, this material has some give to it, making it softer under your feet. Get the advice and guidance you need to help you find the floors that best suit your needs in looks, performance, and price. You can visit our team or have us meet you at your home to help determine your flooring needs and the right solutions to meet them. We let you browse through our selection of vinyl tile flooring and vinyl plank flooring samples so you can see how diverse vinyl can be. Our experts then use the information they collected about your style, budget, and other needs to match you with the vinyl solutions we think will look and function best in your home, giving you the information you need to make an informed purchase decision. Contact us today to learn more about our wide selection of vinyl flooring options. We proudly serve clients throughout Jackson, Jackson Hole, and Wilson, Wyoming.